HTC – one of the leading smartphone makers in the world is all set to announce a new Cloud storage option for its smartphones and tablet to compete with Microsoft’s SkyDrive and Apple’s iCloud. This decision has been made after the Taiwanese giant signed an agreement with Dropbox and both companies decided to offer 5GB of free storage space to HTC users. I can confirm that users of some of the latest HTC models will be able to access additional storage from Dropbox over and above the usual 2GB limit for free subscribers. 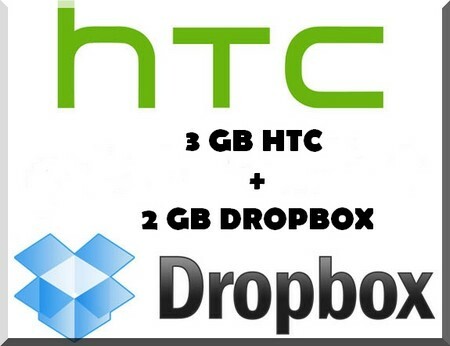 Once users of the new HTC Rhyme connect to Dropbox via their handset, they will receive an additional 3GB of free storage, giving them up to a total of 5 GB. According to HTC, all those users who are in the possession of latest HTC smartphones such as the HTC Sensation XE and HTC Rhyme will get benefit from this service. The company further said that the service is supposed to be launched to all Sense 3.5-powered HTC smartphones soon. Originally, the user will be offered 2GB of Dropbox free storage. The additional 3GB free storage will be added to existing 2GB as soon as they connect to the service after receiving their new smartphones once the shipment will begin. The major feature of this service is its capability of enabling the HTC smartphone and tablet users to choose the files that are shared across several computers, devices and platform. However, it is yet not confirmed if the company’s lineup of Windows Phone will take benefit from this service or not. Windows Phone already receiving services from Microsoft’s own Cloud that offers up to 25GB of storage.